The data for the #BlackSpecFic Report is in this spreadsheet. It is based on self-reported public information; there are always a few writers for which not enough information is locatable. Black writers who don’t publicly self-identify or don’t have established social media presences are welcome to contact us at [email protected] for inclusion of their stories in this count. 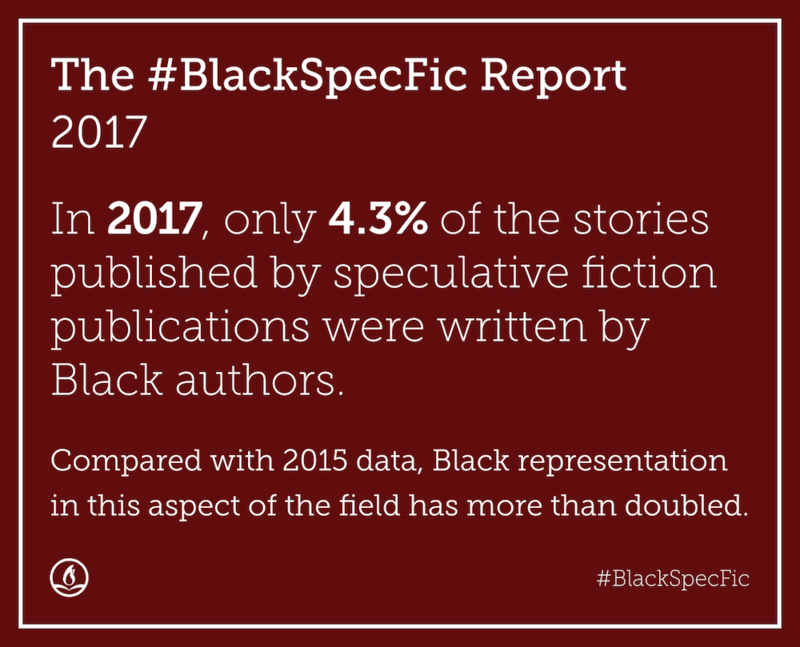 The BlackSpecFic Report began a few years ago, when we1 noticed that speculative fiction publications dramatically underrepresented Black writers2. 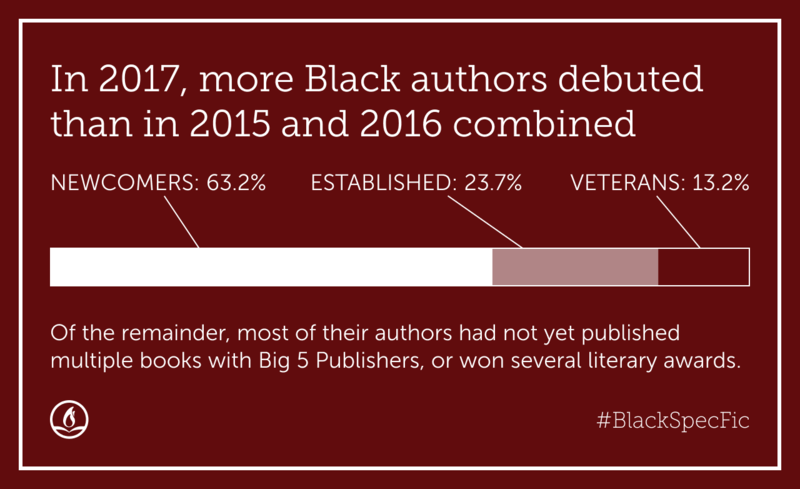 Our 2015 and 2016 investigations yielded extremely troubling information: Black authors had written only about 2% and 3% of those respective years’ published stories. Meanwhile, approximately 13% of the U.S. population3 is Black. Such dramatic underrepresentation can’t be mathematically explained by random factors. Since 2015, the BlackSpecFic Report and other related projects have raised consciousness about this underrepresentation, and 2017 marks the first year that measurable improvements could have resulted from these collective efforts. Although there’s no way to know the extent to which any improvements in representation stem from a previously existing but undocumented upward trend that begins below 2%, we now have a three-year trajectory to compare. So what happened in 2017? Like the previous year, Black representation generally improved at a slightly faster rate4 overall, but those improvements were confined to a handful of magazines — not all but most of which were doing relatively well5 before. The good news is that the primary growth driver appears to be new authors. In 2017, the magazines in this dataset are, as with 2016’s report, professional-rate6 magazines (as defined by the SFWA) that have been in existence for at least two years and are currently open to submissions7. They published 1,112 stories by 816 unique writers, 38 of whom are Black and who wrote 48 of the stories. The unique Black author ratio is 4.7%, and the story ratio is 4.3%. Compared with 2015 data, Black representation in this aspect of the field has essentially doubled. A dozen of 2017’s published Black authors — more than in 2015 and 2016 combined8 — were debut authors; seven more are the author’s first appearance in these pro-rate magazines. In total, half of 2017’s published Black writers were new to pro-rate magazines. Of the remaining stories, most of their authors had not yet published multiple SF/F/H books with Big 5 publishers or won several literary awards. Even more so than in 2016’s report, variation in experience and publication history appears healthy. When we began this initiative, many worried that the majority of the few stories published would be by Black authors with household names; that still is not the case. Two market-level changes happened in 2017. Most magazines that already were performing relatively well had improved, and several magazines started to catch up. Most of the magazines portrayed in this image doubled, tripled, or quadrupled their Black representation from 2015-6 to 2017. When combined with 2 magazines that already performed relatively well in publishing stories by Black authors, but that hadn’t improved9 significantly — namely, Lightspeed and Nightmare — the magazines in this image published about one fourth10 of all stories in this dataset. Yet, they published close to 90%11 of this year’s stories by Black authors. In other words, as with 2016, one quarter of the field is publishing the vast majority of its Black work. Field-wide submission rates12 can’t explain that. Furthermore, while these magazines’ representation varies individually, when taken as a combined unit, their Black representation approximates U.S. population distribution at 13%13. Five14 of them published Black authors at rates approximating or exceeding it. 2017 saw the emergence of Fiyah, a magazine of Black speculative fiction. Fiyah published 22 stories by 22 Black authors during this year. Ten were debut stories. That’s almost as many debuts as were published in the field’s pro rate magazines. It is worth noting that Fiyah is, per story volume, about one fiftieth the size of the pro rate portion of the field. Furthermore, between Fiyah and other magazines and anthologies, Black-specific (such as Sycorax’s Daughters and Steamfunk, people of color-centric (Octavia’s Brood; Long Hidden; Lightspeed’s 2016 People of Colo(u)r Destroy! special issue), and regional (Omenana Magazine; New Worlds, Old Ways; Strange Horizons’ 2018 Southeastern USA special issue), it’s clear that there are many Black writers active in writing and publishing SF/F/H short fiction15. The fact that the top quartile of pro-rate magazines is currently publishing Black writers at levels approximating U.S. population figures strongly suggests that it is perfectly possible for the field as a whole to do so. The field is segregated16, and whether that’s due to variable submission rates, variable acceptance rates, and/or other factors, the data expose a clear instance of structural racism. 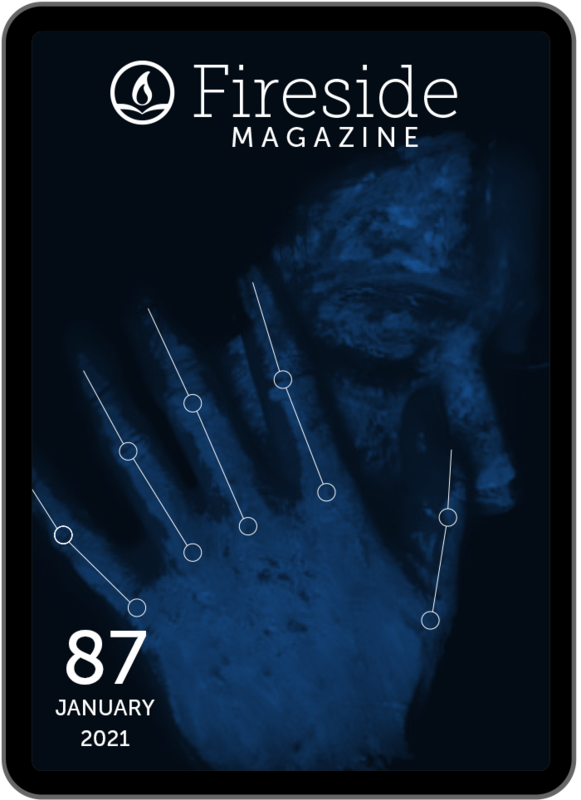 In order to assist Black writers navigating17 the submissions process and to measure magazines’ progress according to parameters that aren’t available in this report, Fiyah Magazine has created the Presence of Blackness score; see L.D. Lewis’ upcoming “POB Score: Growth and Accountability” for a retrospective on creating this metric. Other writers and editors with upcoming perspectives include Mikki Kendall, Khaalidah Muhammad-Ali, Inda Lauryn, and Latonya Pennington. Cecily Kane writes about genre fiction. She can be found on her blog and on Twitter.